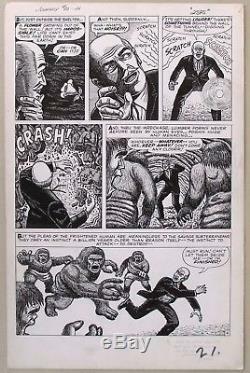 ORIGINAL COMIC ART: JOURNEY INTO MYSTERY #93. Page 4 of a story entitled, The Man Who Wouldn't Die! The item "ORIGINAL COMIC ART JOURNEY INTO MYSTERY #93, 1963, Matt Fox" is in sale since Thursday, October 12, 2017. This item is in the category "Collectibles\Comics\Original Comic Art\Interior Pages". The seller is "amazing-adventures" and is located in San Francisco, California. This item can be shipped to United States, Canada, United Kingdom, Denmark, Romania, Slovakia, Bulgaria, Czech republic, Finland, Hungary, Latvia, Lithuania, Malta, Estonia, Australia, Greece, Portugal, Cyprus, Slovenia, Japan, China, Sweden, South Korea, Indonesia, Taiwan, South africa, Thailand, Belgium, France, Hong Kong, Ireland, Netherlands, Poland, Spain, Italy, Germany, Austria, Israel, Mexico, New Zealand, Singapore, Switzerland, Norway, Saudi arabia, Ukraine, United arab emirates, Qatar, Kuwait, Bahrain, Croatia, Malaysia, Brazil, Colombia, Panama, Jamaica.